COMMENTARY ON "THE CURSE CAUSELESS?" Can mortal man be in the right before God? Can a man be pure before his Maker? Job, a person who was "blameless and upright" didn't lack in his obedience to God and certainly didn't need a lesson in this area of his personal life. Job was blameless in the sight of God. Therefore God's purpose was not about Job's obedience to the law of a covenant that he was not under nor could not have known about. Instead, God reveals to us his purpose, where he challenges Job with a series of unanswerable questions, in Job chapters thirty-eight through forty-one. Upon hearing God's questions Job immediately humbled himself and repented of his not understanding that our holy loving God is sovereign. God's challenging questions to Job teach us that God declares who he is without any need to justify himself, not even to a righteous person. There can be no such thing as righteous people out there watching from somewhere, as claimed by Ellen G. White, waiting to see if God is able to vindicate his character. Such a concept is heresy. Furthermore, 'character traits' (an expression not used in Scripture) describe the actions fallen sinners, not that of our holy righteous Creator God. Monday, Oct. 31: When Have the Innocent Perished? Upon hearing of Job's suffering three friends of his come and sit with him in silence for seven days and nights, Job 1:11-13. Then Job laments his birth in chapters two and three. Eliphaz's questions are both rhetorical and prophetic. The context suggests to us that those who heard his words understood that the "innocent" will never perish or will be ever cut off from God. In the New Testament, those declared "innocent" through the covering shed blood of Jesus Christ, will never "perish" or be "cut off" from God, Acts 16:25-34 & Rom. 8:18-39. These questions of Eliphaz however do not address why Job is suffering because they show that he does not understand or account for the actions of God who is sovereign. We are asked to read Job 4:12-21, where according to the lesson author, "we see Eliphaz seeking to defend the character of God". Adventist theology is handicapped by believing that there is such a thing as "the character of God" and that God himself or anyone else would need to defend that supposed character. So, Is that what Eliphaz is doing in this selected passage of Scripture? Mortal man, in his own righteousness, can not be right when standing before God. Man is not pure, in his own purity, when appearing before God. As Christians, we must know and understand that our righteousness is totally and solely imputed to us through the blood Jesus shed at Calvary, 1 Cor. 1:30. Eliphaz's words concerning the voice of the "spirit" is far more about the limitations of mortal man than of the attributes (not character) of an infinite sovereign holy God. God is not even the one speaking in this passage. It is a "spirit" that contrasts the limitations of mortal man to that of our eternal, all powerful, all knowing Creator God, who has no need or obligation to defend himself. "However, there is a problem here: not all that Eliphaz is saying here is wrong. On the contrary, many of these same thoughts are echoed in other parts of the Bible." The thing wrong with what Eliphaz or his two friends had been saying to Job is that they did not understand or say to Job that God is absolutely sovereign and doesn't always make it apparent why we sometimes suffer as we do. God does as God decides to do without the obligation to explain himself to anyone, not even to a righteous person. Note well that God never justified himself to Job. Instead, God challenged Job with questions he could not answer. The lesson author is correct in seeing that there is a problem. But the problem is centers upon promoting the Great Controversy book and doctrine that limits God's absolute sovereignty by asserting God must justify himself before a "watching world" of righteous people out there somewhere. Again, the lesson assumes there is something wrong with Eliphaz's words but fails to say what that might be. Instead of making this a study of the book of Job and determining what was wrong with Eliphaz's words according what God said, as was covered in yesterday's commentary of Job 42:7-7, todays lesson diverts our attention onto the non-biblical Great Controversy theme. 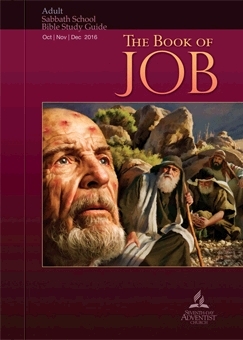 As has been stressed already, the book of Job centers on the theme that God is absolutely sovereign. Since God does not justify himself to anyone, certainly not to those he has created, the premise for the Great Controversy theme is wrong. Or to be put bluntly, it is heresy. "As we have seen, Eliphaz was not without sympathy for Job. It’s just that his sympathy took second place to what he saw as his need to defend the character of God." The lessons for this week end with "thought questions" that ask what a person thinks instead of turning to Scripture and finding out what God says. Furthermore, when you study Job chapters thirty-eight through forty-one, you will see that God does not defend what he does. Instead, God asks a series of questions of Job. Before you can challenge God you must be able to answer those questions, none of which can any of us answer. God is sovereign. It is heresy to suggest anything less. Therefore there is no such thing as "the character of God" that needs defending, not even to a righteous person. The lesson assumes that what Eliphaz and his friends are defending God's character because this is a foundational premise of the false Great Controversy theme. As much as Eliphaz and his friends were wrong in what they said to Job, that was not their folly. God is eternally holy, righteous and sovereign. Therefore God justifies himself to none. Satan was the one challenged by God. However, Satan was so unimportant to God's purpose, his reaction to the outcome of Job's story isn't even recorded. Eliphaz did as instructed by God, and offered up a burnt offering in repentance of his folly, Job 42:9. Ellen G. White does not speak of God what is right as God's servant Job did. Therefore the Great Controversy theme is false and heresy. Copyright 2016 BibleStudiesForAdventists.com. All rights reserved. Revised October 18, 2016. This website is published by Life Assurance Ministries, Camp Verde, Arizona, USA, the publisher of Proclamation! Magazine. Contact email: BibleStudiesForAdventists@gmail.com.